Afghan security forces held their own against the insurgency, sustained the gains made in the 2013 fighting season and successfully secured the presidential and provincial council elections on April 5, 2014. Afghan National Security Forces (ANSF) capabilities continued to expand during the reporting period, while insurgent territorial influence and kinetic capabilities remained static. The ANSF and Afghan election institutions laid the groundwork for a successful election, registering millions of voters and securing thousands of polling sites, with minimal international assistance. These preparations far surpassed Afghanistan’s efforts in the 2009 and 2010 elections. Despite insurgent intent to disrupt the election process, ANSF layered security operations prevented high-profile attacks across the country and voter turnout was high. The large rise in attacks preceding previous Afghan elections did not occur. Despite substantial progress, the ANSF continued to face several challenges during the reporting period. ANSF logistics and sustainment capabilities remained underdeveloped, Afghan National Army (ANA) attrition was higher than its target, and corruption continued. Although the International Security Assistance Force (ISAF) continues to develop capabilities, ANSF requires more time and effort to close four key high-end capability gaps that will remain after the ISAF mission ends on December 31, 2014: air support; intelligence enterprise; special operations; and Afghan security ministry capacity. International funding and coalition force assistance will be critical to sustaining the force after 2014. If a second-round runoff election is required, securing the runoff during the summer fighting season will be a major test of the ANSF. Opinion polling during the reporting period showed that Afghans remain largely optimistic about their country’s trajectory.3 However, the ANSF’s need for post-2014 assistance, the President of Afghanistan’s refusal to sign the U.S.-Afghanistan Bilateral Security Agreement (BSA), the consequent lack of U.S. and NATO post-2014 presence decisions, and simultaneous political, security, and economic transitions generated uncertainty throughout Afghan society. The Taliban tried to capitalize on Afghan uncertainty and fear of abandonment by the coalition through propaganda, without much success. The ANSF remain a cohesive and confident force despite significant casualties, demonstrating tactical superiority over insurgents and maintaining consistent control over Afghanistan’s populated areas. The ANSF’s capacity to execute large, combined combat operations across the country with minimal coalition assistance continued to improve. During the reporting period, each of the six ANA Corps planned and executed multiple complex combined arms operations involving the Afghan Air Force (AAF), special operations, and Afghan National Police (ANP). Although these operations faced several challenges, including coordination between ANA and the ANP, their objectives were achieved overall. Additionally, the ANSF’s performance on Election Day served as a vivid demonstration of their growing ability to provide stability and to overmatch the Taliban. As of March 2014, ANSF force strength reached 340,632 personnel, which is 97.4 percent of the 352,000 authorized end-strength. Including 26,632 ALP personnel, security forces totaled 376,264. Almost all ANSF unit and major equipment fielding is complete. The technologically complex development of the AAF lags behind other elements of the ANSF and some capabilities will not reach full operational status until 2017. As the capabilities of fielded forces improved, the ISAF advisory mission continued to re-orient from combat advising at the unit level to functionally based advising at the Afghan security ministries, the six army corps, and the police zone headquarters. In this new role, advisors focused on developing ANSF sustainment capability and worked to close noted capability gaps. Despite the ANSF’s tactical successes during the reporting period, they face a number of developmental shortfalls (in addition to the four critical high-end capability gaps). Afghanistan’s security ministries require substantive improvements in planning, programming, budgeting, and acquisition. In the fielded force, counter-improvised explosive device (C-IED) units, intelligence, fires, medical, and combined arms integration require improvement. Illiteracy, corruption, and ANA attrition persisted, inhibiting ANSF progress. From the ministries down to the tactical level, GIRoA faced a major challenge in developing an effective, integrated logistics and sustainment system for the ANSF. A lack of trained maintenance technicians combined with a logistics system that struggled to resupply units in the field adversely affected every component of the ANSF. The ANSF relied on ISAF for limited enabler support, particularly in the areas of close air support, casualty evacuation, logistics, CIED, and intelligence, surveillance, and reconnaissance. With equipment fielding and continued ISAF training and advising in 2014, the ANSF are ontrack to transition to full responsibility for security on January 1, 2015. On April 5, 2014, Afghanistan held the first round of its presidential election, which marked another step in the first democratic transfer of power in Afghan history. This election, which the Afghans secured and executed, represents another important milestone in the development of Afghanistan’s institutions and capabilities. The level of ISAF support provided to the ANSF on Election Day was much lower than many analysts had anticipated being required. During the reporting period, Afghanistan’s preparations for the election consistently exceeded expectations, with Afghan electoral institutions and security ministries working cooperatively to ready plans and deliver materials for a credible and transparent election. Prior to Election Day, hundreds of campaign rallies proceeded peacefully, with security provided by the ANSF. The ANSF developed comprehensive plans to secure thousands of polling sites across the country. Additionally, they bolstered domestic observation efforts to allow more than 12,000 domestic observers and more than 300,000 candidate agents to participate in monitoring efforts. These preparations paid off on Election Day, which saw no successful major attacks and less violence than occurred during the 2009 and 2010 elections. Proactive ANSF operations disrupted attacks prior to execution, supporting security efforts at polling site. The successful security efforts visible throughout the campaign season built public confidence, resulting in high voter turnout. Although critical steps in the electoral process remain, including adjudication of fraud complaints, ANSF election security performance was a major milestone in efforts to develop confident, apolitical, and capable Afghan forces that are credible in the eyes of the Afghan people. The Taliban-led insurgency failed to achieve its stated operational objectives over the reporting period. Their major goal over the last several months, and the main propaganda focus, was to disrupt the elections. They were clearly unsuccessful and the comparatively low levels of violence surrounding the election served as a reminder of their limited capabilities in the face of growing ANSF strength. Moreover, the high voter turnout, despite repeated threats issued by Taliban media outlets, reflected the insurgency’s level of influence over the population. The insurgency mounted attacks but was overmatched by the ANSF, generally could not capture or destroy well-defended targets, and was unable to hold significant territory. Nevertheless, the insurgency remained resilient, maintained influence in many rural areas, and carried out attacks with slightly lower frequency than a year ago. Although of limited tactical effect, these attacks allowed the Taliban to reap potentially significant publicity gains. Insurgents continued to seek to conduct high-profile attacks in population centers – as well as against remote outposts – to garner media attention, to project an exaggerated image of their capabilities, and to expand perceptions of insecurity. Sustained ISAF and ANSF counterterrorism operations prevented al Qaeda’s use of Afghanistan as a platform from which to launch transnational terrorist attacks during this period. Counterterrorism operations heavily restricted al Qaeda’s presence to isolated areas of northeastern Afghanistan and limited access to other parts of the country. These efforts forced al Qaeda to focus on survival, rather than on operations against the West. Al Qaeda’s relationship with local Afghan Taliban organizations remains intact and remains an area of concern. The Haqqani Network evolved into the most virulent strain of the insurgency, the greatest risk to coalition forces, and a critical enabler of other terrorist networks. The Haqqani Taliban led the insurgency in the three eastern Afghan provinces of Paktika, Paktiya, and Khost, and demonstrated the capability and intent to support and launch high-profile, complex attacks against Afghans and the coalition across the country. U.S. and Afghanistan political relations remained tense, exacerbated by President Hamid Karzai’s refusal to sign the BSA and GIRoA’s decision to release dozens of detainees over ISAF objections. Many of the detainees are dangerous insurgents, some of whom planned attacks on coalition forces. Although U.S.-Afghan negotiators finalized the text of the BSA in November 2013 and the Afghan people voiced their strong support for a continuing partnership with the United States, President Karzai deferred conclusion of the Agreement to his successor. The United States is prepared to sign the BSA and continues to seek to conclude the Agreement promptly; leading Afghan presidential candidates publicly expressed support for signing the BSA, if elected. The President of the United States made it clear that a signed BSA is necessary for a continued U.S. presence to support Afghanistan’s long-term security and stability and to train, advise, and assist the ANSF post-2014. Pakistan’s government sought to increase engagement with GIRoA, including direct meetings between President Karzai and Prime Minister Nawaz Sharif. Cross-border incidents and lingering mistrust remained points of tension in their relations. Both countries continued to question each other’s commitment to advancing a political settlement in Afghanistan. Pakistan cooperated in some CT activities, applying pressure against Tehrik-e Taliban Pakistan and other militant groups. Pakistan did not take significant action against Afghan-focused insurgent groups in Pakistan during the reporting period. Elements of Pakistan’s government continued to tolerate Afghan-focused insurgent groups attacking U.S. and coalition forces. Pakistan’s civilian and military leadership increased engagement and cooperation with the U.S. on the issue of Afghan-focused insurgents in Pakistan, but efforts to interdict and disrupt the production of IED components fell short of coalition expectations. Afghan insurgent groups maintained sanctuaries in Pakistan, a major factor preventing their decisive defeat in the near term. The presence of ISAF forces partially mitigates the threat of Pakistan-based insurgents to GIRoA, but the use of these sanctuaries by insurgent groups will pose a long-term threat to the stability of Afghanistan following the reduction in coalition forces at the end of 2014. National institutions continued to incrementally improve their ability to provide constitutional, stable, effective, and responsive governance. Significant gains in education, health, access to electricity, and rural development continued during the reporting period. A variety of factors continued to hamper governance at all levels, including: widespread corruption, ineffective program monitoring, budget shortfalls, low revenue generation, insufficient financial management capacity, limited formal education and skills, illiteracy, a lack of coordination between the central government and provincial and district authorities, and an uneven distribution of power among the branches of the Afghan government. At the sub-national level, official government services remained largely restricted to provincial and district centers despite efforts to improve capacity and extend government services to rural areas. GIRoA leadership demonstrated little political will to fight corruption and struggled to increase transparency, accountability, and the rule of law. Corruption continued to be an obstacle to economic development and governance. GIRoA counter-corruption efforts made limited progress. Lack of action on anti-money laundering legislation created conditions that will complicate future international investment and support. The international community continued to be concerned that corruption undermines and lessens the effectiveness of its assistance efforts. Challenges in governance and sustainable economic development, slowed the reinforcement and consolidation of security gains. Ongoing insurgent activity and influence inhibited economic development and improvements in governance. Predatory corruption, criminal patronage, weak rule of law, and reliance on the funding for the insurgency from narco-trafficking are factors which hindered the ability of the ANSF and local GIRoA governance structures to maintain a secure environment and provide essential service delivery. The immaturity of mutually supportive national institutions, such as the justice system, banking sector, and mining sector, exacerbates these factors. Investments in construction and private consumption, driven largely by donor contributions and ISAF spending, bolstered economic growth and development. The reduction of ISAF personnel will likely have a negative effect on economic growth. GIRoA’s failure to enact mineral and mining legislation limited the legal utilization of Afghanistan’s natural resources and created a disincentive for international investment. The people of Afghanistan, the GIRoA, and the international supporters of Afghanistan made important progress during this reporting period. The November 2013 Loya Jirga’s overwhelming endorsement of the BSA and the high turnout for the April 2014 election were strong evidence of popular support for the Afghan government and a continued international partnership and presence. While the Taliban retained influence in parts of the country and maintained their ability to carry out attacks, the nature of these attacks – which frequently target civilians indiscriminately – highlight the differences between the current situation and that which allowed the Taliban to come to power originally. Even as the Taliban retain the ability to carry out attacks, they do so at the expense of any claim to significant popular support. ANSF capability is no longer the biggest uncertainty facing Afghanistan. Since taking the lead for security operations nationwide in June 2013, the ANSF demonstrated an ability to overmatch the Taliban consistently, with limited ISAF support. 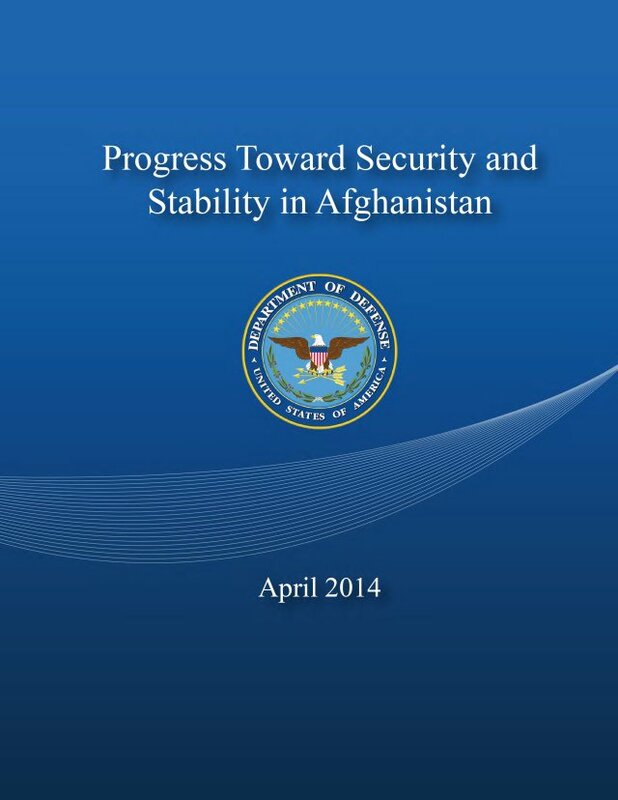 The sustainability of gains to date will be dependent on a number of factors, to include: Afghan ownership of the security and economic problems facing their country, date; the outcome of the Afghan presidential election and Afghanistan’s ability to reach internal political equilibrium; international financial support after 2014; the ability of the new Afghan government to put in place the legal structures needed to attract investment and promote growth; and the size and structure of the post-2014 U.S. and NATO presence. 1 The reporting period for this report is October 1, 2013 through March 31, 2014. This report also includes some initial information regarding the April 5, 2014 elections. 2 These figures compare data from October 1, 2012 - March 13, 2013 vs. October 1, 2013 – March 13, 2014. 3 ISAF ANQAR survey, Wave 23, March 2014.